The SpeedyLam 330R10 is the fastest pouch laminator available, it will laminate up to 12' per minute. That allows you to run a letter sized pouch every 5 seconds. The SpeedyLam 330R10 offers 6 heated rollers, 2 cooling rollers and 2 outlet rollers. This unique 10 roller system offers super fast lamination speeds while assuring high quality results even on difficult to laminate items such as photos, inkjet prints and color copies. Patented cooling system keeps the exterior of the laminator cool to the touch even when doing long production runs. The SpeedyLam 330R10 offers a cool down cycle. Just press and holding the power button, this activates the cool down cycle. The cooling fans will continue to run until the machine has reached the correct shut down temperature. When the system is cooled it will automatically shut itself off thus preventing damage to the heated rollers. The easy to remove top roller cover makes maintenance on the system simple. The LCD display features controls for: Temperature, Speed, Reverse, Hot & Cold, Counter & Reset, Memory and Measure. dimensions - L x W x H: 25" x 13-3/4" x 5-3/4"
We are a small 3 person team who does high volume laminating for our educational product line. We have increased our productivity due to the speed of the Speedy Lam. The machine keeps cool to the touch during extended use. The quality and clarity of the finished documents are very professional. 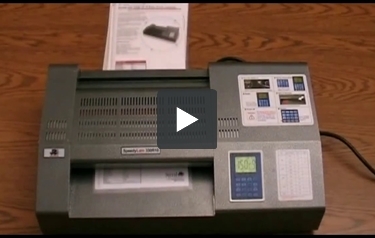 Transcript: The 330R10 is the fastest pouch laminator available. High quality results even on difficult to laminate items such as photos, inkjet prints and color copies. Patented cooling system keeps the exterior of the laminator cool to the touch, even when doing long production runs. LCD display features variable heat and speed controls, reverse, counter with reset, programmable memory and temperature reading. Laminate up to 12' per minute. A letter sized pouch every 5 seconds. The 330R10 is the fastest pouch laminator available. Speed is one of the things you need to be successful in today's business world which is why it makes sense to get a fast laminator. One such device is the Speedy-Lam 330R-10. It's the fastest laminator you can buy, but it does have a couple of small flaws. Let's read all about the strengths and weaknesses of the 330R-10. The name "Speedy-Lam" is perfect for this device because it operates incredibly fast. It's so fast it can laminate a 12-foot document in one minute. Twelve feet is equivalent to 144 inches, so it will take less than 3 seconds for you to laminate a letter-sized document (8.5" x 11). The 330R-10's feed opening is 13 inches wide, so you'll be able to laminate documents of varying sizes. It's possible to laminate legal-sized documents (8.5" x 14") and I.D. cards and everything in between. You can use a variety of pouches, including 10 mil ones. In addition to being fast, the 330R-10 is capable of producing stunningly beautiful results. It has ten rollers - one of the highest amounts available in a laminator) - that are capable of flawlessly laminating all of your documents. Most pouch laminators only have two or four rolleres, so the fact that this one has ten really makes it special. The 330R-10 has multiple temperature settings that range from 0 to 160 degrees Celsius. (The Fahrenheit equivalent is 32 to 320 degrees.) Since the temperature ranges so greatly, you'll be able to laminate heat-sensitive documents. This machine has a reverse function that you can use if a pouch ever gets jammed in the machine. It will get you back to work in a hurry. If you ever need to perform maintenance on the machine, you can just remove the top cover and start tinkering. This is a feature that's unique amongst pouch laminators. When you're done using the machine, you can use the unit's cooling system to cool things off before shutting things down completely. This keeps the motor in good condition. The 330R-10 takes a fair bit of time to warm up. It should be ready for use in about 5 minutes, so you may want to do something else while waiting for it to get ready. This is a very large device that has dimensions of 25" (width) x 13-3/4" (length) x 5-3/4" (height). It might be a tight fit if your office is pretty small. The 30R-10 also isn't as flashy-looking as some of the other laminators available. However, its speediness more than makes up for it. This machine's warranty is on the short side because it only offers 90 days of coverage. Most other manufacturers offer a full-year of coverage, so it's disappointing that this machine's warranty is so short. In a nutshell, the Speedy-Lam 330R-10 is the laminator to get if you want to be able to laminate a lot of documents in a flash. You're going to be more than impressed with its speed and the fact that every item processes will look great. You'll just have to get used to the five-minute warm-up time and size of the device. If those two things aren't a concern, get the 330R-10 today to see how quickly it can work for you.